I often talk about super-mom ideals, and how I can never live up to them. However, a few months ago I was introduced to a book that taught me how to make artisan-quality bread from home — a definite super-mom high! The book: Artisan Bread in Five Minutes a Day ($18 at amazon.com). It is amazing because it’s really easy. Unceremoniously pour all ingredients into a large bowl (I use a 6-quart food storage container with lid). Mix with a wooden spoon until well combined. Let rise at room temperature for two hours, and the dough is ready to use. You can also refrigerate and use the dough for up to two weeks — this capability is the real beauty of the recipe. When you want to make a loaf, put flour on your hands and a cutting board, pull out a hunk of dough and work into a ball shape (keep in mind you’re not kneading the dough here, just quickly working it into a ball). Place ball of dough on cutting board and let set while oven preheats to 450 degrees. If you have a pizza stone, place this in the oven to preheat as well. Once oven is ready, dust a little flour on surface of ball and make several shallow slashes using a serrated knife. Alternatively, at our house we will sprinkle a bit of garlic into olive oil, brush onto the top of the ball; sprinkle on parmesan cheese; and then slash. Place dough on stone and cook for 30 minutes. By eliminating all the fuss that generally accompanies bread making, this book’s approach is totally doable. I have virtually stopped buying bread. I never buy baguettes or french loaves because the ones I can make at home are so much better (not to mention cheaper). I can also use this recipe to make sandwich bread although from time to time I’ll still buy sliced whole wheat bread to have on hand for a quick sandwich. With this dough I also made my first-ever batch of cinnamon rolls, which my family loved so much we’ve now decided to make them a Christmas-morning tradition. Cinnamon Rolls are a bit more time consuming than the other bread recipes, they take about 10-15 minutes hands-on time, so still super fast compared to the traditional way of making them. The super-mom trick here is to make up the rolls the night before and set in the fridge so all you have to do in the morning is pop them into the oven. If for nothing more than the pizza, keeping this dough on hand is well worth it. With this refrigerated dough, I can make pizza quicker than I can pick it up or have it delivered. Plus the homemade pizza recipe in this book actually tastes as good as delivery. I don’t like frozen or take-and-bake pizza, and I generally think any homemade pizza tastes too soggy. So when I made pizza with this dough, I was surprised at how much it tastes like delivery. Last week my husband made a BBQ Chicken Pizza that was better than the kind we’ve always ordered from California Pizza Kitchen. Even though we have a Little Caesars around the corner with $5 large pizzas anytime, we have not ordered a pizza since I got this book last November — shocking, I know! It is not often that I can say a book I’ve read has changed my life, but as strange as it may sound, Artisan Bread in Five Minutes a Day has truly changed the way my family lives, eats and much more. If you’re interested in whole-wheat recipes or need gluten-free, also check out the newest book from these authors Healthy Bread in Five Minutes a Day. Sounds absolutely devine!!!! I love home-made fresh bread and was just commenting to someone on how my break machine was broken… Now I know I can make my own and it’s super easy! I am going to order the artisan book and the healthy book! 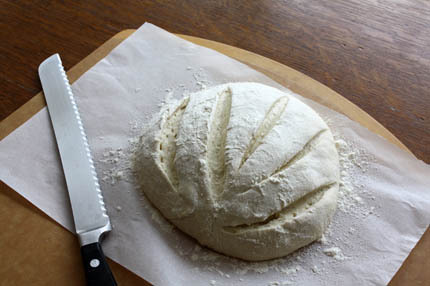 Love, love, love Artisan Bread in 5 Min. a Day! 1. What temperature is the water? 2. If you don’t have a Stone can I put it on a baking sheet instead? Hi Megan, One of the beauties of this recipe is that you don’t have to fuss too much about what temperature the ingredients are or what order to put them in. I just throw everything in a bucket, in any order I feel like, and mix well. Turns out great every time. As far as the temperature goes you just don’t want it to be very hot or cold — lukewarm is good, but honestly don’t worry about using a thermometer, just use your finger. Do you make only one loaf per recipe or do you split it in two? Each batch makes 3-4 loaves but the beauty of this dough is that you can refrigerate it for up to 2 weeks, so we usually make the loaves fresh as we need them. Everything just sounds awesome. Do you have the receipe for the orange butter?? I LOVE this recipe! I made French bread and used the leftover for mini sammies. They were to die for! At what temp and for how long do I do the pizza dough?